Tree to Tree Adventure Park opened in May 2010 and was the first aerial park of its kind on the West Coast. We construct state-the-art obstacles and zip lines using the safest equipment available to provide a variety of adrenaline-pumping outdoor activities that are fun for the whole family. Our park offers many adventure-filled activities that accommodate a range of ages and skill levels, so everyone can feel comfortable playing among the trees. Start your day with our Aerial Adventure, which includes six aerial obstacle courses set high in the trees. Each course has a series of obstacles, with 60 obstacles in total. Another option is Woody’s Ziptastic Voyage, a zip line canopy tour that has you strapping in for the thrill of a lifetime. Go soaring through the sky and take in the sights below, including an exciting 1,280-foot-long super zip line through the trees. Better yet, choose both adventures. Get ready to make a leap of faith. Climb up to our 65-foot platform and step off into thin air. You’ll free-fall a spine-tingling 20 feet before your safety harness slows you down and gently sets you back on solid ground. If you think you’re brave enough for the tree-top plunge, add it to either the aerial obstacle course or the zip line tour. This extra adventure is strictly for participants between 50 and 250 pounds and won’t soon be forgotten. Get the best deal on the biggest adventures by purchasing a combo package. Grab the Tree Top Plunge at a special price as part of the Aerial Obstacle Course Triple Play package or the Zip Tour Triple Play package. Both packages allow you to choose to take part in either the racing zip lines or the Monkey Grove. Or choose a full day of extreme adventure with the All Adventure park pass that lets you take part in all five park attractions. 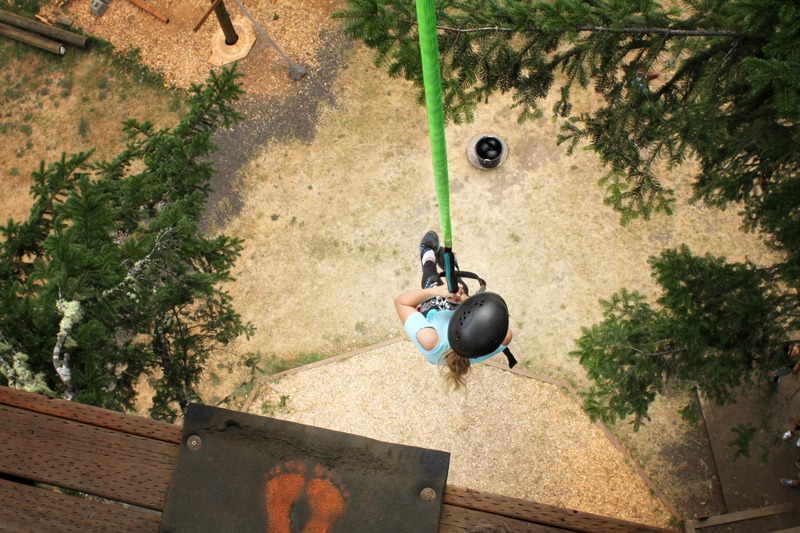 Tree to Tree Adventure Park is located in Gaston, Oregon, just an hour from Portland, and open from March to mid-November, rain or shine. Reservations are required and available on a first-come, first-served basis. Contact us at (503) 357-0109 to schedule your adventure today.